Yeah, but: How can I rate something I can't pronounce? The Long Version: I've liked orange chocolate since my father would bring home Terry's from his trips to England. Dark chocolate is a more recently acquired taste, and not one that everyone shares, but I prefer it because I find I can eat less of it and still be quite happy. So when Penny found these, she naturally thought of me, and brought home a little tin of these chocolates. The dark chocolate is quite mild, and the orange is really nicely balanced. They're very good; I managed to make the little 43 gram tin last over a week. The small tin actually isn't much more expensive than a 230g bag of dark chocolate M&M's, so while they're definitely indulgent, they don't need to wait for an annual occasion. I did spend a bit of time trying to find out what, exactly, chocoiste means. The closest I came to finding an answer was that she's a flight attendant who loves to travel, work out, and can sit for hours watching movies. 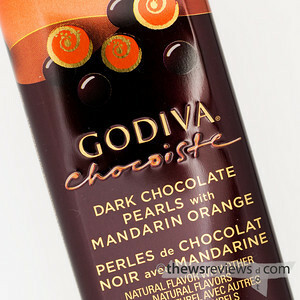 Godiva's website is here. I would probably LOVE this stuff.